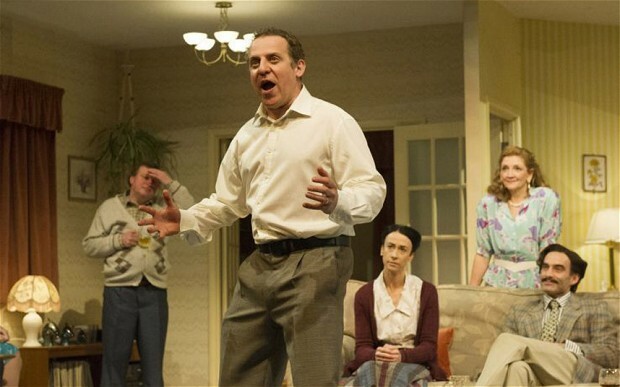 The National Theatre website currently advertises its revival of Alan Ayckbourn’s A Small Family Business as running until the 27 August 2014; given middling reviews and, more damagingly, the desolate swath empty seats all around, this now seems a trifle optimistic. One wonders if Ayckbourn has lost touch with his heartland and whether that distant sound is of Geoffrey Howe readying his poison pen. If the above analo gy seems tortured and meaningless in 2014 then try sitting through two and half hours of Thatcher-era satirical farce played, almost without exception, as if actors were being paid by the minute. Astute readers may have gathered that A Small Family Business is not considered a success. 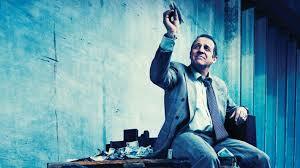 There are many problems with the production but at its heart is the play. Ayckbourn is a fine dramatist – one whose reputation has grown as the subtle radicalism of his writing and staging has become ever more appreciated – but his work has always run the risk of being too identified with the period that he critiques. Whereas writers like Pinter and Beckett examine the universal, Ayckbourn’s skill has always been the microscopic. He is one of the great observers; capable of skewering the social charade and unveiling the fissure lines that runs through society, the unspoken conventions of the British that permeates life and ensures everyone conforms to their class. The conclusion that can be drawn from A Small Family Business is that we have entered a period where his targets are no longer recognisable. It may be quarter of a century old but the world that Ayckbourn has pictured seems embarrassingly quaint; quintessentially English, it is not comforting in the same way that we relax into a Miss Marple and it is not a period piece in the way we might enjoy something by Noel Coward. Indeed one of the more charmingly amusing ideas in the play is the idea that Britain has any small family-run businesses at all, let alone ones that aren’t riddled by corruption. Fundamentally the world has moved on whilst the play has remained static in time. The 1980’s was not a good decade to remain static and the result is a script that, to a modern ear, is painfully anachronistic. A world where CDs are the height of technology, where people dream of moving to Spain and cooking Lancashire hotpot, where a daughter is a Goth? It is not a place we want to be, and it tells us nothing about the modern world. Other problems abound, the biggest being why it is staged on the Olivier at all. If ever a play was suited to proscenium arch it is this. The set is a cut-away of a house. The use of the revolve was extraneous and added absolutely nothing to the play. Indeed in a play where the message is the cavalier attitude to the little frauds in life, it is profoundly depressing if the National doesn’t see the irony of wasting many thousands using the Olivier space, and the revolve, for no purpose whatsoever. In a world where public bodies across England are tightening their belts, and where many arts organisations went to the wall after the withdrawal of funding, it is rather sickening to see an organisation as well funded as the National Theatre blithely pay so little regard to public value. On a positive note, Matthew Cottle as Benedict Clough was a real treat. Apparently an Ayckbourn regular and notably the only person on stage who seemed entirely comfortable in the material; he worked the material to within an inch of its life (the only way you can do it in farce) and, with a few deft mannerisms, stitched together a coherent character out of the caricature. Much of the rest of the cast seemed to want to be somewhere else, which was a feeling they at least shared with the majority of the audience. Nigel Lindsay tried his best but couldn’t help walking around with the air of someone who had been in The Thick of It and knew that modern farce and satire could be funny. The general acting was leaden and not helped by a direction that seemed to be playing everything on half speed. *Comment minted May 2014. Depending on your decade please feel free to insert with any suitable reference to Rupert Murdoch (1980s), Robert Maxwell (1990s), AOL-Time Warner (2000s), Glazers (2010s) and your script can be as culturally relevant today as it was when it was first written.